I needed a change!! I have been dreaming of a new kitchen table for a while now. Due to the fact my husband is in school, it is not in the budget to buy a whole new table. I decided to take matters in my own hands, and do it yourself diva it! Here is the Before. The legs and all chairs were painted an off white color. 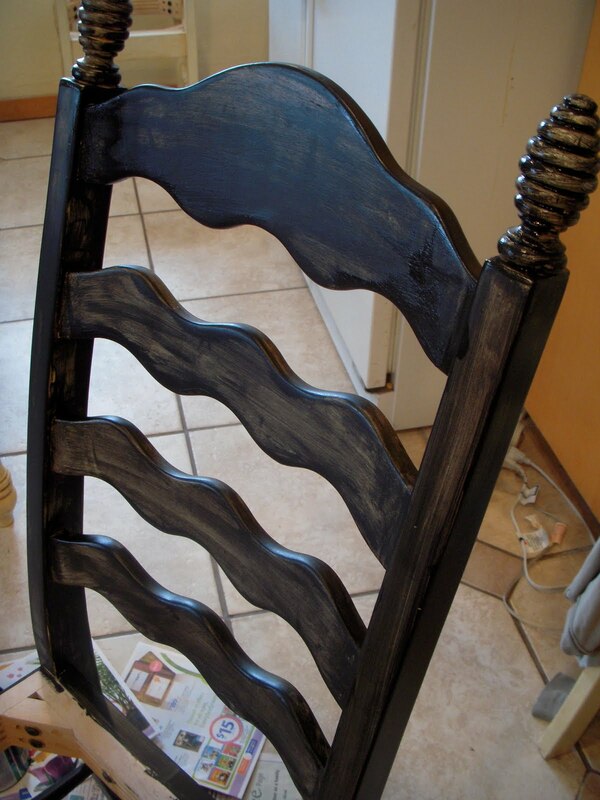 I thought that painting the cream color black, and staining the wood color would look simply beautiful. Here's hoping! 1. Before I painted or sanded or stained ANYTHING, I scrubbed and cleaned every surface. Warm water, soap and a sponge did the trick. 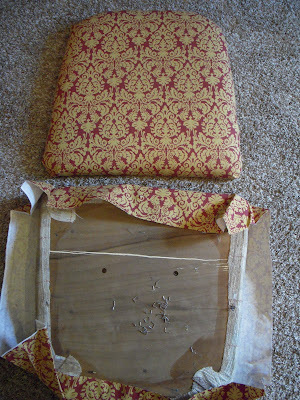 I also removed all seat cushions as shown above. 2. I then sanded down most surfaces. I used a very fine sandpaper, aka 220 grain. 3. After sanding make sure to clean the surface again making sure to get rid of ALL dust! 5. Paint in the direction of the wood grain. 6. Let it set for the allotted time. 7. Wipe stain away once the time stated on the can is up. 8. I repeated these steps 3 times to get the rich color I wanted. 9. Here's what you need to paint. Lots of newspaper, favorite color of paint, and sponge paint brushes. The lady at Home Depot advised me to use real paint brushes, but I found that the sponge paint brushes worked wonderfully, especially for the detailed parts of the chairs. 9. Paint away making sure you are always painting along the grain of the wood. I did a grad total of 3 coats of paint on each chair and on the legs of my table, plus touch ups. 10. While my paint was drying, I decided it was time to change up the fabric on my cushions!! 11. 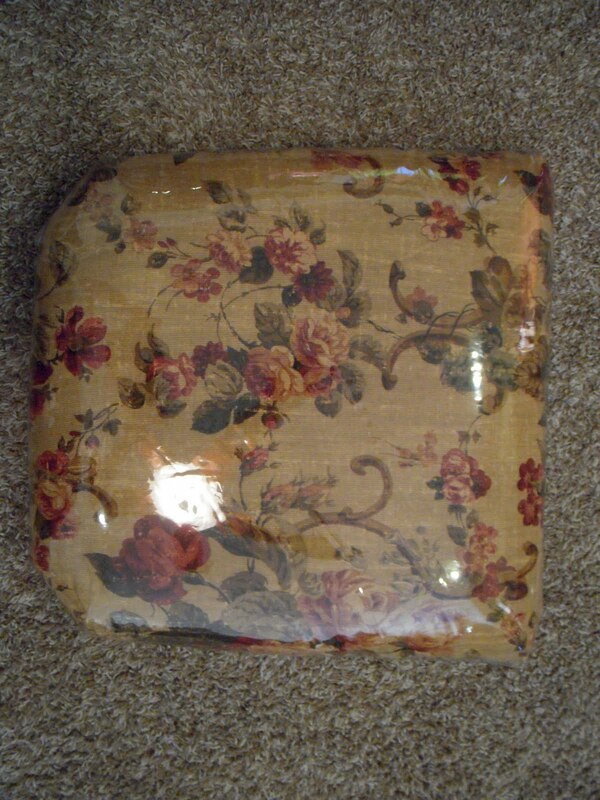 After measuring and matching my cushions with fabric I LOVED, I folded it tightly around the cushion. 12. I stapled the fabric in place until I felt that it was smooth and under control. 13. 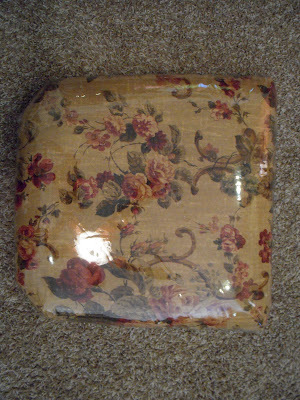 Because of my baby, and babies to come someday I felt it necessary to preserve my lovely fabric with plastic. You can buy this at Walmart by the yard in the fabric/craft section. 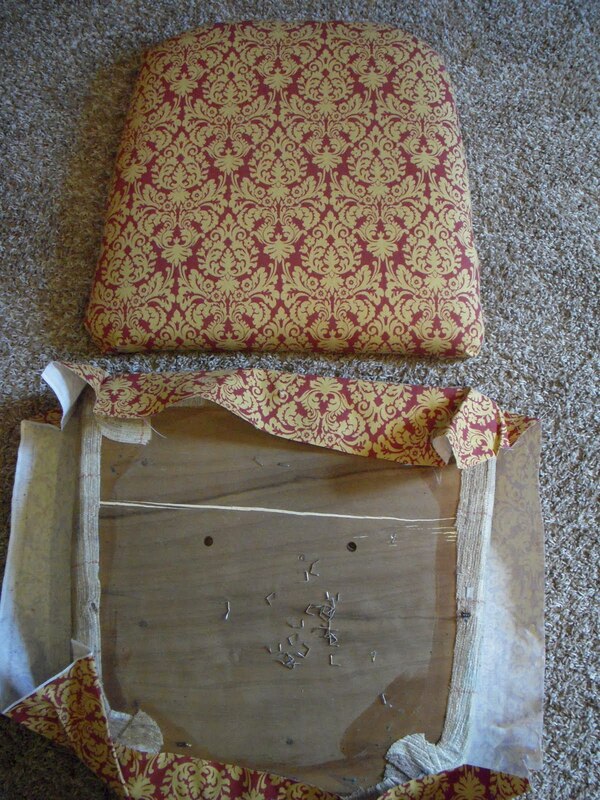 I measured, and fit it to wrap around my cushions just like I did the fabric. 14. Grab your staple gun and get busy again! 16. After cushions are wrapped up and stapled, fasten them to your chairs again... and you have completed your TABLE MAKEOVER!! I AM IN L-O-V-E with my new table. BTW, this took about a week and a half from start to finish! All in all it cost me around $35-40 to complete this dream come true! Amazing! It looks like you just bought it brand new! Of course I thought the before looked pretty great, too! Good job! Looks good! We got a table for free from my grandparents last summer and we painted it all black. Whew it was a lot of work but turned out great. I thought that the sponge brushes worked the best too! Just found this blog looking for the onesie idea. LOVE IT. So excited to see more fabric projects! I LOVE your table! I just found this link to this blog of yours and I am amazed at all of your projects. You are so crafty! I can't wait to refinish my table now, you motivated me! :) So cute! My table after living through a now 8 year old and nearly 5 year old needs a facelift. Thanks for inspiration! I have carried out a few renovation projects myself but I have to say yours look fab. The plastic on the seats is a bit tacky, but nice job on the table! @anonymous -I would love your suggestions on how to keep sticky little fingers from touching nice fabric!! 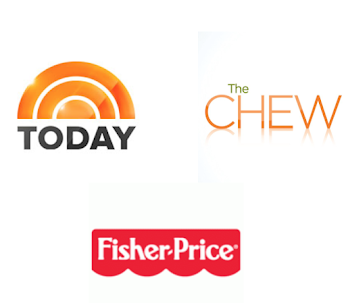 We are ALWAYS open to any new ideas. :) Thanks for the nice compliments on the table. Your table and chairs look great! How are they holding up? Any hindsight suggestions? Beautiful table and chairs, but WHAT WERE YOU THINKING putting that awful fabric and PLASTIC for the seat covers??? @ Megan, the great news is, I can always change out the fabric and plastic seats covers. It has been over a year now since I did this project and I am starting to get the itch to update again! :) I hope one day, when I don't have a two year old I can "grow out" of the sticky finger stage and be rid of the tacky plastic.. you have no idea!! Thanks for the nice comments on the table though! Love this! I just sanded down my table last night and wasn't sure what color to paint or stain it. Now I know!! I think the plastic on the chairs is brilliant! I have a 5, 3 and 1 year old and I know exactly why you did this. I think I may even get a thin piece of glass cut for the top of my table to keep it looking new. Thanks for your awesome blog!!! Anyone who has children can understand and appreciate the pastic on the seat cushions!! I'm sure the negative sayers will either take the wonderful advice or have nasty chairs when they do have children. You did a fantastic job! Love the look of your table and chairs! I have a white kitchen table with a stained table top that I never liked.I was always planning on restaining the top a darker shade.Now that I see how easy it was,it will be my next project.Thanks for the inspiration! I did fabric on my chairs and I have 3 young kids. I just scotched guarded it well and when anything spilled on it, came right off. Nice job on the table! @Terri - you are brilliant!!! I love that idea. Thank you so much for sharing! This is really lovely. Very nice job! The color combination is just beautiful. The plastic over the fabric seemed unusual to me only because I haven't seen that before on dining chairs. When my girls were younger I sewed slip covers for the chair seats but sticky fingers still reached underneath and it did not protect against spills. The plastic cover is a good solution for households with children despite others' aversion. The way it's fitted around with the fabric keeps it from looking "cheap" and also gives a nice sheen to the chair seats to match the sheen of the table top. In my opinion, it's brilliant. I had the fabric laminated for my kitchen chairs when my grandson was young, per the suggestion of an interior decorator. I love the way your table turned out.. I was wondering if you used any type of polyurethane on top of stain? and what color wood stain did you use? I am working on mine now and can't decide on a color but wanted it dark but not to dark and yours is perfect! What color of paint/name or brand... did you use for thr chairs and legs? I love it!! What kind and color of stain did you use? hi Ruba! I believe that I used the minwax red mahogany. It is one of my favorite stains that they make! Did you add any poly or sealant to the top? And how has to top held up with or without it? Thanks! Hi there Kami. I did use a poly on the top. It has held up beautifully!!! The more coats of poly that you use the better! would it be possible to complete this project within a day or two if we were completely devoted to it? Just wondering because you mentioned it took a week and a half and i am super anxious for a new table! I think it may be possible.. Just be sure to read the labels on the products you are using to ensure you are letting thins cure and dry for the right amount of time!!! Good luck! These are my favorite kinds if projects! Please send a pic of your finished project! I would LOVE to see! Diydivas2@gmail.com! What color & brand is the black paint used for the table base and chairs? I love it and would like to try the same thing on my dining room set. Thanks!